So, in other words, we just capture some image (make screenshot), perform blur effect and use this blurred image for our needs. But if you open control center above some dynamic content you'll notice that control center's blurred background is changing as well as content does. Does anybody know how to replicate this behavior? The only way I see it is to capture content and make blur effect with some interval (e.g. half a second). But it looks redundantly. To avoid color breaking, do not use barTintColor. You also may change style of toolbar if you want dark styled blur (use UIBarStyleBlack). Unlike toolbar it more positive, but it's dynamic mechanism is rare yet and in fact it can be used only for static background. (dynamic = NO). 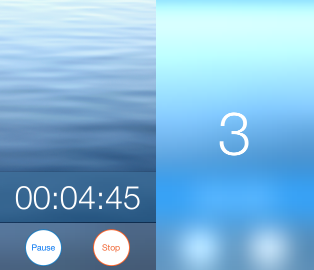 In iOS8 we can implement blur effect on views using UIVisualEffect class. You can use below code to apply blur effect on view. I've found LiveFrost to be a great, and easy to integrate project for live blurring. You can use UIVisualEffect from storyboard. Drag the Visual Effect With Blur on the storyboard. The desired effect can be achieved by setting alpha of the BACKGROUND COLOR. The subviews should be added to View of Visual Effect View and they are not affected by the background blur. 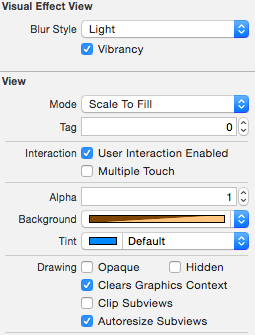 The Vibrancy effect must be selected in View options above. Not the answer you're looking for? Browse other questions tagged iphone objective-c blur ios7 or ask your own question.